The San Francisco Municipal Transportation Agency (SFMTA) will hold a vote Tuesday that may potentially ban buses and vans from one of the most visited sites in San Francisco, the Full House property. Sam Brock reports. The San Francisco Municipal Transportation Agency (SFMTA) will hold a vote Tuesday that may potentially ban buses and vans from one of the most visited sites in San Francisco, the "Full House" property. "I grew up watching 'Full House' back in a part of Southern India," said tourist Shaun Reddy. "So it’s very important, I relate to it." 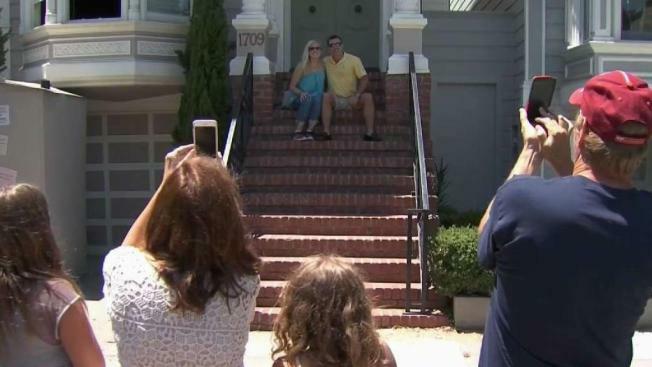 So many people visit the iconic home, that neighbors are begging the city to help control the crowds, claiming it’s a safety hazard. "Large vehicles were parking on the block, right in front of the house," said Paul Rose from SFMTA. "That was causing people who were driving, walking, riding bikes to go around those large vehicles into the traffic lane and that’s creating a safety hazard." The SFMTA will weigh a ban on buses and vans, though people who live in the area say cars and ride-sharing trips clog things up too. "We’ve been dealing with it for a while, but in the last couple of years since they’ve started construction again, it’s gotten way more chaotic," said Nicholas Hollister, whose home is attached to the Full House. Hollister said the release of the show’s spinoff on Netflix, "Fuller House", unleased a new torrent of visitors. "People were very, very angry," he said. "So the whole block has kind of come together in a sense." Signs posted next to the home help explain that anger, they say things like "we hear you all day long" and "please keep the volume down." SFMTA will turn its attention on the ban Tuesday and if passed, it will go into effect in four to six weeks.